Next week WKCR-FM 89.9 www.wkcr.org, promises all-day music of Ornette Coleman and Bix Beiderbecke, linking the “free jazz” iconoclast (turning 80 Mar 9) to the Roaring ’20s jazz-mad kid cornetist/pianist (who would be 107 on March 10, if he hadn’t drunk himself to death at age 28 in 1931). Mark your calendars now! According to Anabel Anderson, WKCR’s current co-director of jazz programming, the Ornette broadcast runs from 12 am Tuesday to 12 am Wednesday, the Bix from midnight Wednesday to 12 am Thursday. Maybe it’s a wee obsessive to want to listen to either Ornette or Bix or 24 hours (news and id breaks included, no ads on non-commercial radio. As powerfully influenced if not out-right directed by Phil Schapp, an extraordinary broadcaster and jazz/recordings historian, the Columbia University student-run upper-west-side Manhattan-based station is no stranger to marathon programming — indeed, that’s one of its hallmarks along with a jumble of authoritative and never-before-on-air djs, a vast range of unusual music, and a signal that’s not available city wide, except via the web, of course. Anyway, these day-long celebrations are usually chronological, meaning in Ornette’s case probably his recordings at the Hillcrest Club in LA in 1958, in the quintet pianist Paul Bley built around him, with Don Cherry on trumpet/cornet, Charlie Haden on bass and Billie Higgins on drums (in ’59 sans Bley — who’d already come east on his own — those four hit NYC and sparked an uprising against jazz’s then-atrophying conventions). 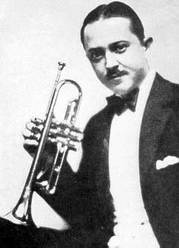 For Bix, it’s the Wolverines Orchestra’s “Fidgety Feet” and “Jazz Me Blues,” recorded Feb. 18, 1924, which demonstrated that jazz had penetrated the spirits of young men from Davenport, Iowa, and they’d learned to play it with élan. There’s not a lot of commonality of sound between ’24 and ’58, except maybe for the exciting outpouring of energy, enthusiasm, idealism, individuality and interaction amongst the musicians, that makes it all seem so American. Here’s an interesting blog that’s all things Bix and here’s an inspiring if typically, abstractly far-reaching interview Mike Chamberlain, a colleague in Montreal, conducted last year with Ornette. I salute ‘KCR (as I often have in the past, though not publically) for bridging 80 years of this music that’s basic and exemplary of our vernacular, in depth, over 48 hours. Will I listen to every moment? Er, maybe, maybe not. But someone will be listening at all times. I found there’re two kinds of genius: one dies too young, the other lives too long, haha. HM: Thanks for your comment, but I couldn’t disagree more: real genius lives forever. 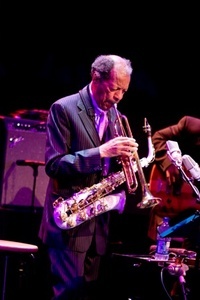 And Ornette is playing beautiful music, as per his performance opening the Jazz at Lincoln Center season last September, reported elsewhere on this blog. Agree with your completely! And as far as I’m concerned, they all don’t live long enough! An intriguing comparison of these two. Should be great. WKCR is one of the most important stations especially in New York. Yet they have the poorest FM reception and the worst web presence. I live about 35 miles from Manhattan and getting WKCR even in the car is at best sketchy. But that is understandable. The web stream is still at 56k and mono. That is neither understandable nor acceptable. “WKCR is one of the most important stations especially in New York. Yet they have the poorest FM reception and the worst web presence. I hear you, Richard. I live part of the year in Westchester, where WKCR and WBGO come in erratically at best. Then again, Looking at my gig calendar over the years (my gigging life is in the past for now), Westchester and Fairfield Cos., especially, seem to constitute a kind of No-Jazz Zone on the ground as well as in the ether. The gigs, the fans, the circuit are more in NYC/LI/NJ, and that, usually, is that. Could be that the broadcasters recognize this, but aren’t willing to acknowledge it. Could also be that I’m full of shee-yit – just one man’s experience/opinion. I just get frustrated at jazz becoming, little by little, a regional dialect of music that only New York and selected exurbs find relevant. HM: Strange there’s so little music in those counties, as lots of jazz musicians live in Westchester (Fairfield I don’t know at all). The summer two-weekends of jazz at Caramoor are good as far as they go but wouldn’t be enough to quench my jazz thirsts. 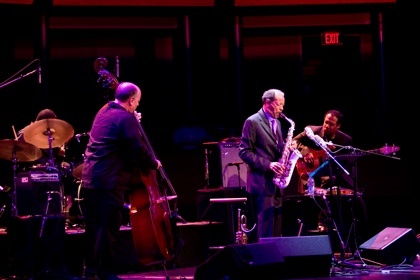 Jazz *is* spoken beyond NYC/NJ though — I hear from jazz friends from Florida up through New Hampshire and points west! Maybe few and far between, not always services by radio (though with the internet. . . ) and too little support for live music performance. Building all that up is the goal.